Have you ever had a thought that just would not leave you alone? Seriously. You think the thought, and then you think, “Hmm, that’s interesting,” and then you go back to doing the dishes or singing the song that’s playing on your car radio? Then, three days later, you’re in the grocery store and the guy behind you in line says something to you and, for unknown reasons, that thought pops back in your head? And on and on it goes – until you actually tell someone. This blog post is coming from one of those thoughts. You see, sometimes I dismiss those thoughts as unimportant or as … nothing. Ironically, “nothing” is what my thought is about. “Nothing” or the lack of it. That’s it. That’s the thought I haven’t been able to shake for months now. “Nothing” is impossible. Now, when I talk about these verses with people and when I’ve heard them preached, it’s as if the words “nothing” and “all things” are modifying the truly important words: “possible” and “impossible.” And please hear me – I’m not arguing against that. We teach that “God” and “Possible” are inextricably joined in both instances, and that’s true, and that’s fantastic news. 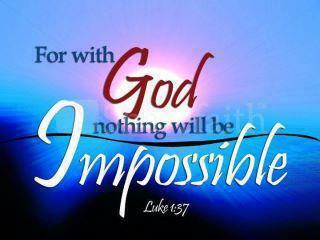 All things are possible with God. And God is in all things. And – wow – I don’t know about you but I am excited by that thought! May God reveal to you the possibilities that lie in all things for you – and that you, surely, are part of all things. Please let me know if you have any thoughts about this – and have a beautiful day! LOVE this! We have “all things” in Him! It is impossible for us to have nothing when we are in His care. Beautiful! Thanks, Anita! I’m so glad my message came along loud and clear. God is so good! Hi Connie! I gotta love a fussy grammar girl! I don’t know all the rules either, but my kids knew I would correct their speech if it was wrong! I love your new take on ‘Nothing’ is Impossible. And you are so right. God does not rest…ever. He is always moving on our behalf, grace after grace in our laps as we hurry and worry. How can a good Father sit back and do nothing as his children flounder? I love learning new interpretations. Thanks for this one today! And thank you for all your support in following me. I’m so happy to make a new blog-friend.